Are Roaches Triggering Your Asthma? Cockroaches are more than a nuisance because they easily multiply in large numbers and are difficult to control. Furthermore, roaches and their excrement can trigger allergies and more serious respiratory complications. They also carry bacteria and other microorganisms that can cause disease in humans. The best method to preventing a roach infestation is to tackle the problem once it is noticed. In some rare situations, roach control can be achieved and maintained with various products purchased online and in local stores. This method of defense is usually the first approach individuals choose when they notice a problem. Sprays can kill roaches immediately, while bait stations are used for their ability to kill roaches that are not seen. Other remedies such as boric acid and some gels may help create a toxic barrier to keep roaches outside. Unfortunately, many individuals find that conventional methods of killing and preventing a roach infestation are ineffective, or only work the first few months. Some roaches are seemingly immune to standard approaches, and some breeds of roaches are much too large to fit into bait stations, rendering them ineffective. In these situations, it is best to seek services from a professional pest control company. There are many companies that can help with roach control, such as Green Pest Solutions. They are highly knowledgeable in the various types of roaches and the means to eliminate and prevent them. When most people think about allergies, they think of outdoor allergens, such as plants and trees, or indoor offenders such as dust and mold. However, roaches can be a major contributor of indoor allergies. Roach excrement and saliva contain components that can cause allergic reactions in individuals already sensitive to allergens. In more severe cases, these allergens can trigger an asthma attack in both children and adults. Asthma attacks due to roaches are more likely to be severe and more difficult to control, because roaches in the household become a constant source of irritation. In addition to allergies and respiratory problems, roaches are a major component in the transmission of diseases. 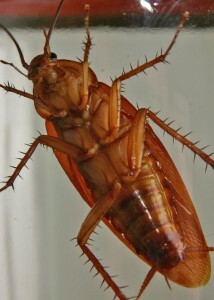 Roaches can transport harmful bacteria, such as E. coli and Salmonella around a household. It may seem obvious to not ingest food that has been contaminated by roaches, or where it appears they may have chewed threw a bag or box. However, the transmission of disease can be less obvious. Roaches may have traveled along countertops, cutting boards or dishes, which pose a risk of contamination if food is prepared or eaten from these surfaces. Even an individual touching their eyes or mouth after unknowingly touching a surface that has been traveled upon by roaches can be infected. There are numerous reasons that roach removal is important, especially the potential for illness. Once one roach is noticed, it is safe to assume there are more in the household. Since a roach infestation is difficult to control, it is best to seek the services of a professional for roach removal as soon as possible, before it is more difficult to treat. For more information on cockaroach allergies please visit http://www.aafa.org.